As Aier said, Flamewing S3's Driver hasn't been updated, or touched to be honest, since 2013. It's possible, but you'd be going in the dark as it'd be a lot of trial and error. Flamewing S3's Driver is still used nowadays, as iirc someone on Discord accidentally released their disassembly containing the driver mentioned. As Aier_ said, Flamewing S3's Driver hasn't been updated, or touched to be honest, since 2013. Also, you can't just "install Mega PCM": it's incompatible with S2's driver. You'd have to install S1's driver as well, which uses the 68k just like the Clone Driver. EMK-20218 and Tanman Tanner like this. And don't call me me "Aier_" just Aier =P, someone already had my name and I had to put the "_"
Huh. Maybe I should check GitHub before I jump to conclusions. And yes, I'm aware MegaPCM doesn't work with Sonic 2's Driver, I just assumed that went without saying. My mistake, though. Edit: Ah, I see why you brought up the MegaPCM when the disassembly is Sonic 2: there's a lack of a Sonic 1 Driver to Sonic 2 guide that is up to date with all Sonic 2 disasms. So you really can't just "install" it. Updating my original post. I'm using one in my Sonic 1 AS Disassembly. 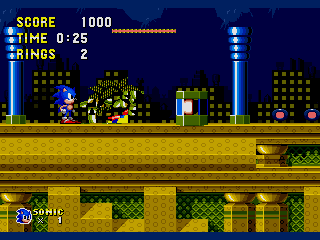 The game runs the SEGA Screen and SSRG Screen in an infinite loop. Is there something I should alter to the SSRG Screen that breaks it out of that loop and goes straight to the Sonic 1 Title after the SSRG Screen the first time? Additionally, for some reason, now I can't even go to the title screen with the SSRG Screen removed, the SEGA Screen constantly loops. EDIT: I figured it out, apparently setting the gamemode value to 24 as max opposed to 20 in MainGameLoop fixed the issue. So it works! I just need to make it work with the Sonic 2 Clone Driver v2 in playing sounds, but everything else works. What's the hexadecimal position of the Signposts in Sonic 1's Green Hill Zone Act 1 and 2, and Eggman and Boss Capsule in Act 3? EDIT: Eggman spawning is handled by the game's code apparently. So, now I have a new problem regards adding new art to zones. I'm positive it's been answered before, but I don't know the exact term for it. The tree from Casino Night Zone in Sonic 2 somewhats loads, but as the level fully loads, the lower half is replaced by bumper tiles. Now, before the level fully loads, I can see the tree for a split second before these bumper tiles overwrite it. What do I need to do, exactly? Alter my PLCs? Put in a new DMA Queue? Or making room in VRAM? It sounds like some of the level's art tiles in VRAM are being overwritten by the PLC for the bumper objects' tiles, so you'll need to alter your PLCs. 0-10 $01-$400 Tile number in VRAM. To get the actual address in VRAM, multiply this number by $20 (32 decimal). 11 $800 If clear, sprites will be drawn normally. If set, sprites will be flipped horizontally. 12 $1000 If clear, sprites will be drawn normally. If set, sprites will be flipped vertically. 15 $8000 If clear, sprite will be drawn on low plane. If set, sprite will be drawn on high plane. You'll need to go into the bumper's code (file "_incobj\47 Bumper.asm" in S1 Github disasm), and increase its tile number used for obGfx SST appropriately, so that it doesn't overwrite the level art. PLC entries use VRAM addresses instead of tile number offsets, so you'll need to AND obGFX value by $7FF in order to get the tile number, and then multiply that value by $20 to use for your PLC entry. You'll want to modify that word value at Nem_Bumper with your new one. Remember to adjust the offsets appropriately for consecutive PLCs located after Nem_Bumper's VRAM address, so that other object art won't be overwritten by adjusted PLC entries. You may also need to put some conditionals statements to apply different obGFX values in certain zones for certain shared objects (such as enemies) if they get relocated. The nomenclature and location for these changes in other S1 disasms will vary, but the steps are the same. I recommend using FireRat's bugfixed version of Gens' KMod for viewing VRAM contents and watching PLCs getting loaded for debugging. Do note that its VRAM viewer displays tile number offsets, vs. VRAM addresses in Gens 2.11a rerecording or similar, so you'll need to multiply/divide by $20 as needed to get the proper values to use. Tanman Tanner and AkumaYin like this. Spring Yard Zone has unused tile art right at the beginning of it's zone art, it's the beta "Let's go" sign, which was never used. This is 32 tiles from VRAM 0020 to 0420, overwrite and use those tiles for your tree. Tanman Tanner, AkumaYin and TheInvisibleSun like this. So, I'm bothered that the background was looking too detailed that it would make the visuals polluted. My solution was to make it more bright, to give it a "pastel" looking. Well, It seems that it doesnt look to saturated, but it's kinda weird to see the water having more contrast than the rest. But at least, it doesnt look too dark. I dunno if I mantain that, or if i take a step back and think again. So i'm here to ask: Is this change worthful? Does It makes any good difference? I really like the pastel idea because it shows the distance between the mountains and stuff in the back and the foreground and the colors are more pleasing to look at. I don't mind the water having more contrast since the darker parts are a bit closer. Plus, the background has a blue hue to it already so that seems to justify the water being very blue. I'd say that you should try making the water lighter, but if you can't get it to look better, then don't worry about it. Megalomania and Aier like this. ProjectFM, Natsumi and Aier like this. I liked how it looks before, giving some sort of mist in the lake, but is too "pink" now, making the foreground too dark. But this isi just my opinion; If you use the same colors but less bright it could work, still, nice job so far! AkumaYin and Megalomania like this. The results aren't this severe on PAL, I'm guessing it's because the game has more time to process the layout changes? Anyway, Is it possible to "skip" drawing new changes for a frame so that the previous frame remains for 2 frames and glosses over this one? That's an idea I had to overcome this issue, but I'm not sure if it's feasible to do that. If anybody has ideas on how I could fix this that'd be great. I don't know how yours works so I can't give any specific answers. Assuming you did this by using a modified version of the level loading code, my recommendation is to make sure there is no extra code doing anything you don't need it to do like reloading the palette. Then, find anything in the code that will end up waiting a frame or more, and move that to before or after it does stuff that would have visual effects. Another stupid question regarding Sonic 1 from yours truly. I 'deleted' a zone in the game, Labyrinth Zone. I say deleted because it's still there, it's just the level order makes it skip over it, making it ultimately unused. I also removed the mapping and artwork from the zone to save up on space, so literally you can't do anything in it. I want to know if there was a way that if Labyrinth Zone Acts 1-3 and Scrap Brain Zone 3 would cause the game to crash being selected via Level Select or even if the zones themselves are loaded, as I use a custom error handler for my ROM Hack. More or less what I'm asking for is just asking what methods can I do in the disassembly that would crash the game upon those 4 acts mentioned being selected via level select. My reasoning behind removing it is that I didn't want to bother myself with working with water levels (I was never really a fan of them) and just in case I add artwork to my other zones. I didn't just remove it altogether because I like people who find unused things in games, such as the same people who found the unused zones in Sonic 2. Edit the pointer file so it goes to a different level or make it not load anything. I'm not sure how to eaxactly do the latter, though. It works by calling loadLevelLayout and LoadCollisionIndexes then offsetting the camera and every objects position by the position of the screen at the end of the act to get them to the start of act 2. Then I set the Screen_redraw_flag, which used to be called the Dirty_flag, to redraw the screen. As far as I can tell this isn't doing anything more than I need it to. I'm really not sure what would make the entire game stall for a frame while also letting it process everything, any recommendations?